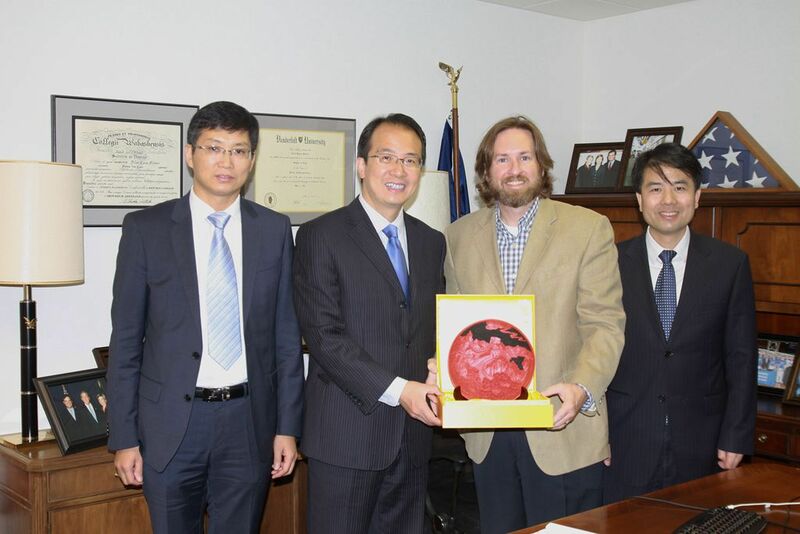 On August 31, Consul General Hong Lei visited U.S. Congressman Luke Messer's district office in Shelbyville, Indiana and met with District Director Jason Kneeland. Consul General Hong Lei introduced China-US relations and cooperation and exchanges between China and Indiana. He said that since the establishment of diplomatic relations, China and the US have enjoyed closer economic, trade and cultural exchanges and had sound cooperation in addressing international and regional hot-spot issues. As the world's largest developing and developed countries, China and the US have more common interests than differences and can cooperate in more fields. The Chinese side hopes Congressman Messer can continue to support Indiana’s friendly cooperation with China and promote the development of China-US relations. Director Kneeland said he is glad to see that Indiana’s exchanges and cooperation with China have yielded positive outcomes. Congressman Messer believes China is an important trading partner and export market for the US and the two sides should enhance mutual understanding and deepen cooperation. The district office will keep in touch with the Consulate General. Deputy Consul General Yu Peng was present at the meeting.